Another major shift in the mobile market over the last year has been the shrinking of Apple’s dominance, particularly in the tablet realm. In the late summer of 2011 Apple commanded as much as 81% of the tablet space, according to our data. A little over a year later, that has fallen to about half, as a wider range of Android devices have entered the market. Our survey data also revealed though that iPad owners are more engaged mobile news users, including being more engaged with news. With the release this fall of Apple’s iPad Mini and Google’s Nexus 7, the competition is only likely to become more intense. What do the demographics tell us about those who are likely to buy one device over another? 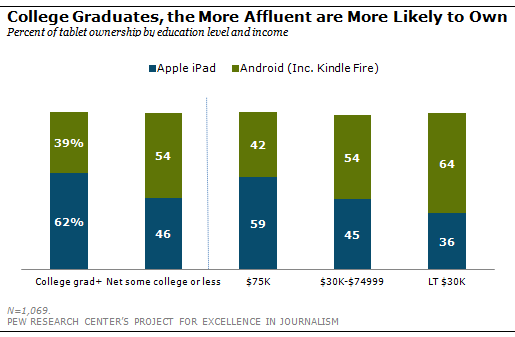 Here, the biggest differences come in education and income, with the college educated and those with a higher household income more apt to have iPads. Some difference also emerges across age groups. 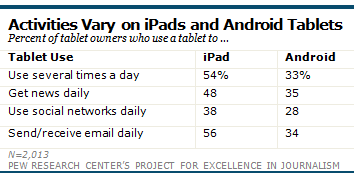 Those 65 and older are more likely to have iPad while other age groups are split about equally between iPad and Android. Fully two-thirds of tablet users 65 and older own an iPad (67%) compared with 47% of 18-29 year olds, 52% of 30-49 year olds and 51% of those 50-64 years old. There is very little difference, though, in the buying tendencies of men and women.